This Mackmyra, like many bottlings of this distillery, does not knock me off the stool. The finish looks very much on top, which is particularly evident in the taste. The nose seems to be divided in half. This makes the whisky come across very unbalanced. Despite the length of the departure hardly anything happens here. A yeasty, bready scent rises first in the nose. After this has subsided, almonds, nuts and sweetened popcorn come to light. The nose is surprisingly present for 42% Alc. Later, I discover flavors of kirsch and ginger. Somehow, something roast pork is always subtle. I hope that's not because of my dinner (no, it was not roast pork). The taste is initially wonderfully soft with a lot of caramel and milk chocolate, but over time becomes crispier and spicier with rum grapes, almost as if the finishing barrels would now take over. The finish is medium (nevertheless surprisingly long for 42% Alc.) With caramel. Unfortunately, the aftertaste is one-dimensional and the weakest element of this whisky. Cloudberries are Sweden’s most sought after berries to make wine. 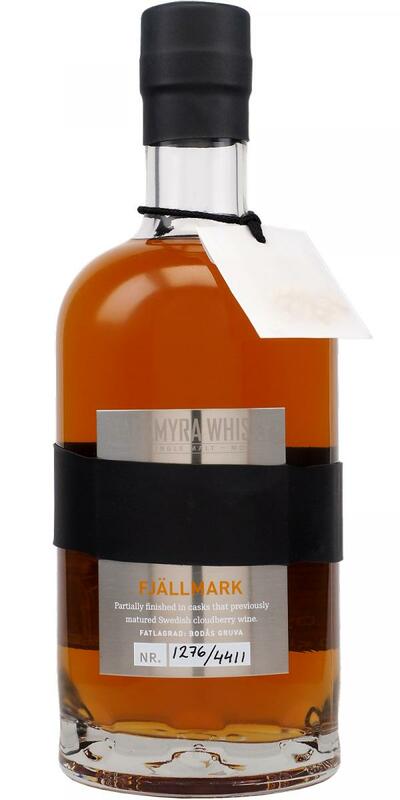 This Moment release from Mackmyra – that was named Fjällmark – matured on those casks and then got a finish on sherry casks, both oloroso and PX. The youngest cask in the mix is 8 years old, the oldest 13 years. 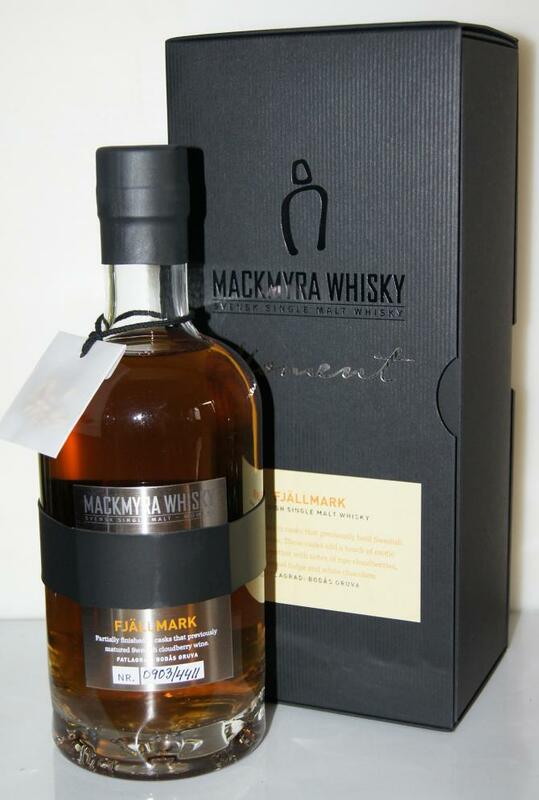 It is one of the few Mackmyra that is not bottled at 46.1%, but at ‘only’ 42%. I’m sure Angela knows what she is doing. The nose betrays the wine from the get-go, but I have to add that it is not really my cuppa. It is sweet and sour with an oaky touch. Baked pears, sweet farmer’s butter, hazelnuts and almonds and some white chocolate. This all sounds quite pleasant if it was not for that weird scent – must be those cloudberries, I suppose – that I really do not like. This returns on the palate and dominates. The sweet and sour fruity note even has a salty lining and seems to lack balance. Although the oak with its spices and some buttery notes tries to steer things back in the right direction, I cannot despite serious effort start to like this. The medium long finish evolves (luckily) from sweet and sour to just sweet. This is another good example of Mackmyra's thirst for expirmenting with different casks. This was partly matured in casks that previously held cloudberry wine (never heard of it, so I can't tell anything further) and ex-sherry casks. It smells and tastes therefore not as a "regular" ex-sherry matured whisky. It has added sweetness, but it's also backed by enough acidity to get balance. Not the most complex, but an utterly friendly whisky. The nose is vinous, but fresh. It makes me think of a refill sherry nose, but then with a bit more sweetness to it. The fruit is a combination between orange, dried grape and fig. Then there is this earthy, leafy character with wet soil and autumn leaves (maybe a hint of tobacco). The toasted signature is there, just as some pleasant vanilla. Even sweeter than I thought, but with nice acidity to balance this. Like a dessert wine or a medium sweet sherry, but not as oxidised as commonly encountered with sweet sherries. Treacle, wood, pine resin, bay leaf, soil, raisins, red fruit and sugar. It's a very nice surprise! Velvety, and long. It's still rather sweet, but still balanced by soft spices and acidity. Treacle, red fruit, raisin, tobacco, allspice, polished wood and orange juice.